When students are developing their research skills and learning how to conduct scientific experiments, they need proper lab furniture. With the right science tables and lab stools, budding young chemists and physicists can enjoy hands-on education. Whether they are having a lesson or engaging in a dissection, great furniture will keep everyone focused on the task at hand. How should you arrange a school science lab? You should have sturdy lab tables or complete laboratory workstations, with enough space for every student to work comfortably. Our eye wash stations and lab showers ensure that students are protected. What are the most important elements of school science lab design? The first thing to consider when furnishing an entire lab is the work surface options. 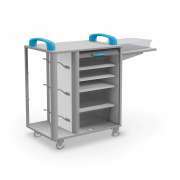 Workstations and tables are both great options. Ultimately, the right choice depends on your needs. Lab tables are more versatile because they can be moved around when you want to rearrange a classroom. Workstations, however, have the added convenience of built in gas and water fixtures. If your science curriculum includes many experiments that utilize an open flame, having enough gas fixtures in the room is very important. No matter which configuration you select, you will need to choose the ideal work surface material for your environment. 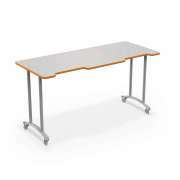 Lab tables are much tougher than regular tables so they can withstand the chemicals and other harsh materials that are used for experiments. Surface materials come in varying degrees of toughness including chemical-resistant and epoxy resin options. Laboratory tables generally seat two students side by side. This is an ideal arrangement because many teachers like students to work in pairs. When students work together they develop important communication skills and use less supplies per person. How should I choose lab table arrangements? 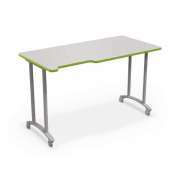 Workstations come in forward-facing arrangements, or with students seated on all sides. If you have many instructional periods in which students must face the board and take notes, it is important for everyone to be facing forward so they can see clearly. Lab workstations facilitate work in pairs or larger groups. While you are making sure that budding scientists have a place to work, don't forget about their teachers. Be sure to include a well-equipped instructor's desk that is as well. What kind of chairs should you have in the science lab? Every room in a school needs to have appropriate seating, and the science classroom is no exception. No matter how work spaces are configured, our lab stools provide the support that is needed during classes. They come in a variety of materials and styles, from leading manufacturers including National Public Seating, Academia and OFM. Choose hardboard, hard plastic or padded seats. We even have swivel stools with anti-bacterial, anti-microbial vinyl upholstery. If you prefer mesh or wooden stools, we have those too. Models are available with and without backrests, with square or round seats. 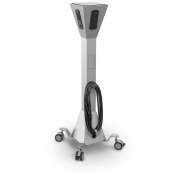 To make sure that people of all sizes can stay positioned properly, adjustable-height options are available as well. 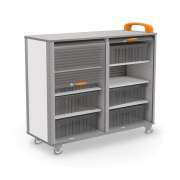 Where is the best place to store science lab materials? Every experiment requires a unique set of materials. Rather than having to run back and forth to a storage closet or spend a considerable amount of time setting up the laboratory in advance you can keep all necessary materials handy with lab storage. 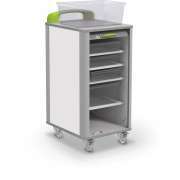 Lab cabinets come with either wood or glass doors, in freestanding, mobile and wall-mounted models. If you are working with extremely harsh chemicals, flammable liquids safety cabinets from Edsal will keep everything securely stowed away when not in use. 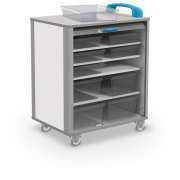 Microscope storage cabinets are available as well. How can I make the science lab safe? Ensure that every experiment is a safe one with precautionary equipment. Every operational lab needs to have a lab shower and eye wash station, in case of the unlikely event that they are needed. You can get both of these items installed in one unit or order them separately. We even have eyewash stations that can be installed on a regular sink. Demonstrate proper technique and regard for the learning process with lab furniture from Hertz Furniture. All of our items are safe and functional so students and teachers can enjoy a proper worry-free experiment experience. If you need help arranging your space and choosing the ideal furnishings for it, contact the experts at the Hertz Design Center for free project-planning advice.